This week I’ve been playing with WonderFil’s Splendor Thread Packs and stitching a variety of placemats. 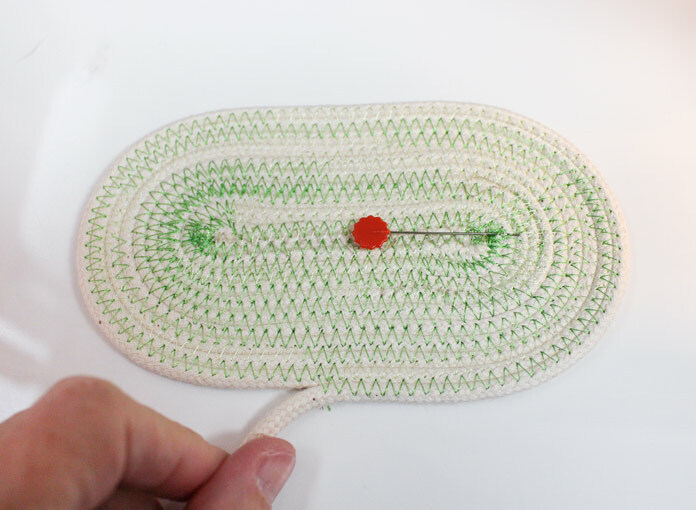 If you’re just joining in today, here’s the exciting list of techniques we used while playing with these colorful thread packs and making cool placemats to boot! Monday: Hexagon Placemats using the Fall Thread Pack. Wednesday: I used decorative stitches to create the illusion of woven ribbons in my Holiday Ribbons Placemats using the Christmas Thread Pack. Thursday: And yesterday I created the fabric using decorative stitches to then make the applique for the Alphabet Applique Placemat, using the Bright Thread Pack. Today I’m straying from the ‘quilting’ focus and using piping cord and the Variegated A thread pack. 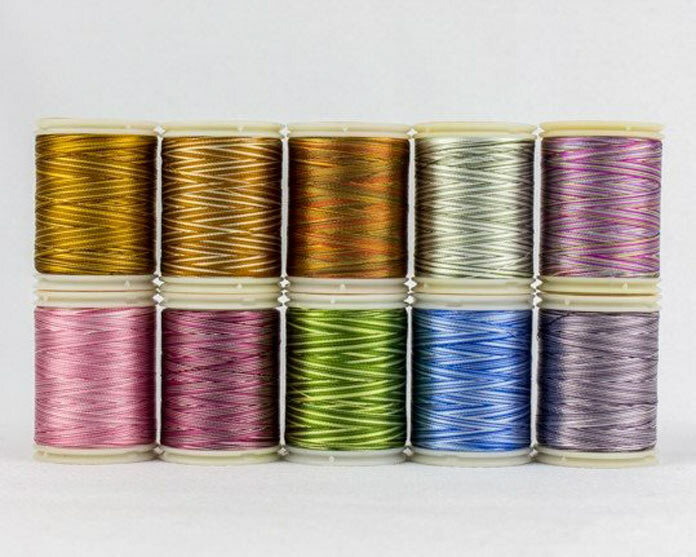 There are 3 variegated thread packs and each one has a different combination of variegated threads. Some are light to dark values of a color. 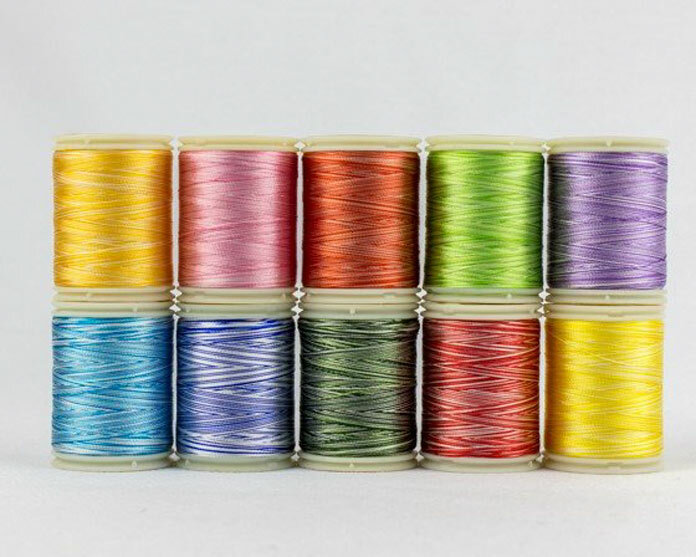 Some threads are a combination of different colors. I’ve found that about 20yds [18.3m] of cording will make a nice sized placemat. I begin with a 3″ length folded piping cord, and using a matching thread and a zigzag stitch, I anchored the original folds in place. Begin stitching the placemat with matching thread. I switched to the variegated thread and sewed over the original anchor stitches. At first I needed to sew slowly around the corners but once I got going, everything was easy. This variegated green moves from a bright green to a very, very light green. 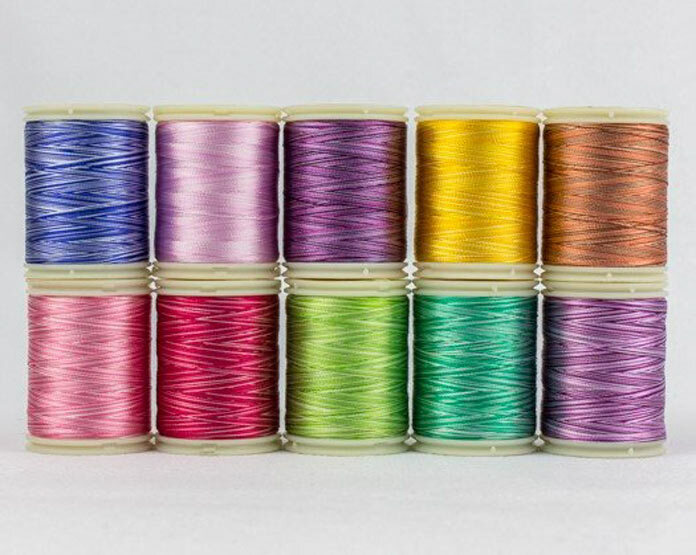 WonderFil’s variegated threads are random dyed. The lengths of each color are never the same length. I find it adds interest to sewing projects. The pin marks the beginning of the row. 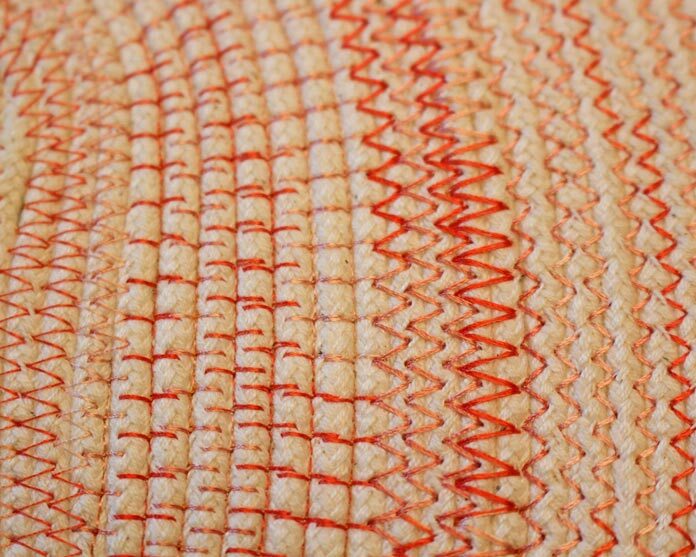 I changed from a regular zigzag stitch to a double zigzag stitch, which helped to highlight the red to very light pink variegated thread. The red is darker and the light is lighter. I’ve found that the machine’s default stitch length and width is perfect for these projects. I tried some different stitches using this red to salmon pink variegated thread. I used an heirloom stitch, double zigzag and also played with the stitch width. 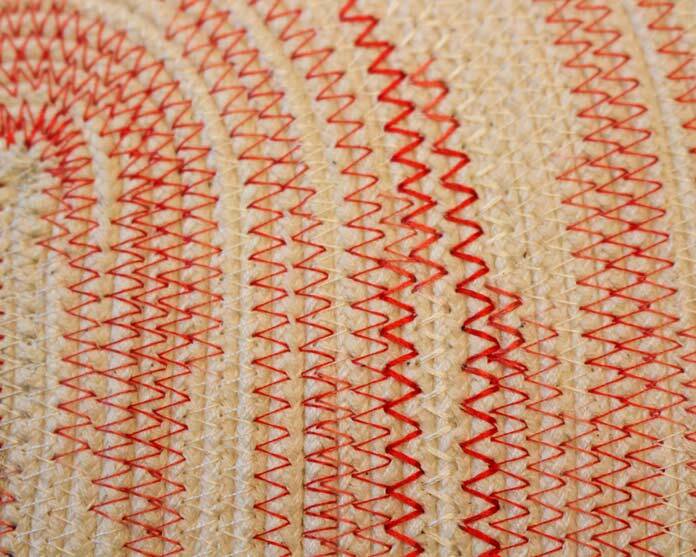 When using a narrower stitch be very careful that both sides of the zigzag stitch catch both parts of the cording! I changed from a yellow variegated to a green variegated thread every 10 rounds. It adds a lot of interest. 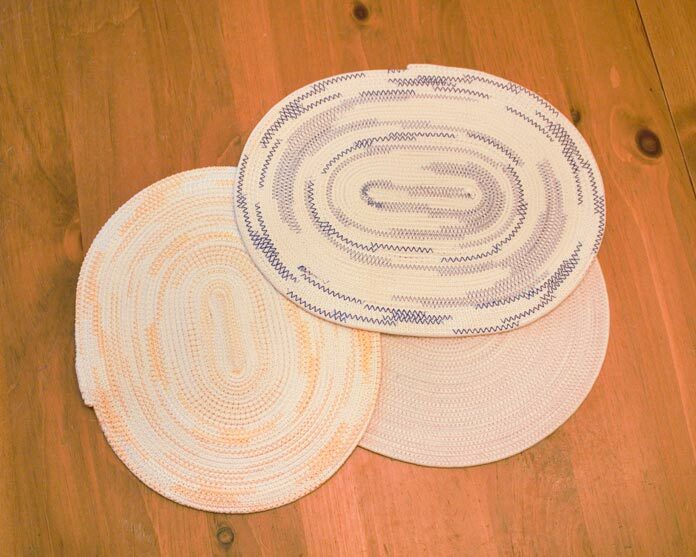 I sewed a total of 4 corded variegated placemats this week. Compare the picture above with the one below. The picture below shows the reverse side of each placemat. The red and white front has a blue and white back. The red and salmon pink has a golden yellow and white back. 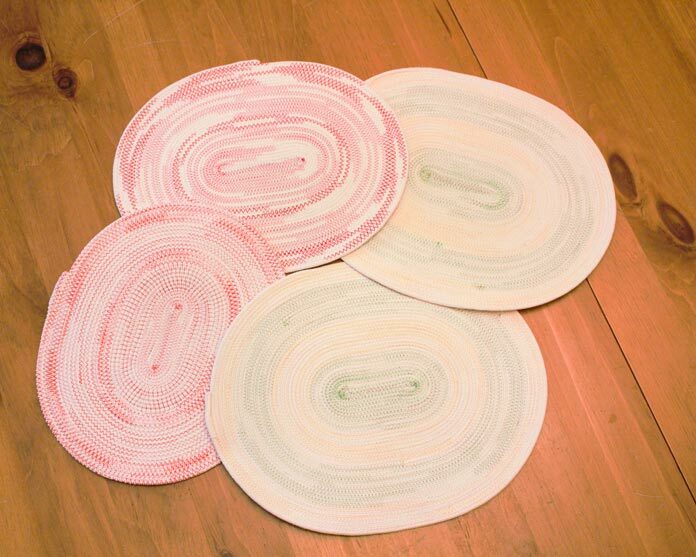 The yellow and green striped placemats have a plain cotton matching thread on the back. When I get to the end of my placemat, I pull out the center core for a few inches and trim. I then fold over the outer part of the cord and stitch over the folded end. These can be used as placemats, table centerpieces or places to put hot dishes. This has been a fun week creating placemats using WonderFil’s Splendor Thread Packs. 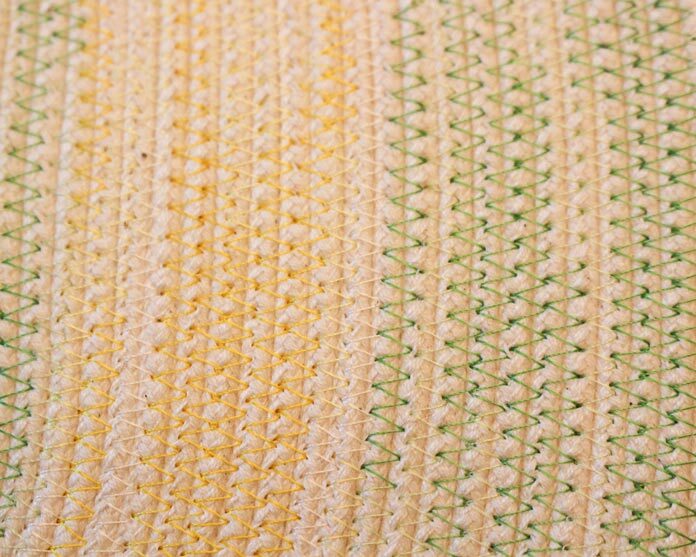 I’ve shown you how I created stripes in my fabric with just decorative stitches. I’ve shown you how I’ve added decorative stitches to stitch and flip placemats. I’ve also used the stitches to create ribbons on the woven placemats. My granddaughter loves her new placemat with her initial appliqued on it. And I finished the week with a project that allows the variegated threads to really shine! One final thing. These thread packs make great gifts. They’re reasonably priced and the colors are coordinated. Add a few matching fat quarters of fabric to a thread pack and you’re ready to go. I’m sure everyone has done one of those fabric wrapped bowls or bags. I’m lazy and instead of wrapping the clothesline with fabric, I’ve made bags with just the clothesline and thread! I now use narrow cotton piping cord. It’s much thinner and easier to sew through.